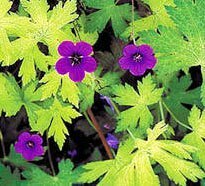 The perennial geranium or cranesbill species and cultivars listed are a small sampling of those useful for specific garden situations, perennial borders, woodland, groundcover and rock garden. G. x ‘Rozanne’ – Hardy in USDA zones 5-8. Iridescent saucer-shaped violet-blue flowers with bright white centers; flowers profusely from late spring to early summer, even into fall. Performs best in cooler regions. Grows 20 to 24 inches tall and 24 to 28 inches wide. It’s was the Perennial Plant of the Year in 2008. More specific growing and care information is here. G. endressii ‘Wargrave Pink’ – Zone 4-8. 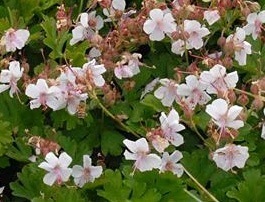 Salmon-pink, 1-inch flowers begin bloom in early summer above shiny green palmately cut leaves. Flowers continue all summer in the north, but stress in southern heat after late spring. Full sun required in the north, afternoon shade in the south. Requires excellent drainage. Grows about 15-18 inches high and wide. Cut foliage back after flowering. Good partners are Veronica ‘Icicle’ in the garden or massed with lambs ears (Stachys byzantina) beneath roses. G. platypetalum (Broad-petaled Geranium) – Zones 3-8. Flowering begins in late spring with purple 1-inch flowers on sticky stalks. Leaves are dark green, velvety, 4-6 inches wide, and deeply divided with rounded lobes. The plants form neat, strong clumps in full sun to partial shade. Grows 18-24 inches high and as wide. Combines well with pinks (Dianthus sp.) and/or light yellow verbascums in sun, or lungwort (Pulmonaria sp.) in shade. G. phaeum ‘Samobor’ (Mourning Widow) – Zones 5-7. Purple flowers with flaring petals are held high above the rounded foliage, which has a broad band of purple-brown. Shady, moist areas are best, but the thick rhizomes will withstand some drought. Plants are 18-30 inches high and wide. Combines well with yellow-leaved hostas. G. sylvaticum ‘Mayflower’ – Zones 5-8. Rich violet-blue 1-inch wide, upward facing flowers with a white base bloom in May (north) or April (south). Leaves are 6-7 inches wide, both rounded and incised. Best in part shade and moist soil. The plants will grow to 30-36 in. tall and wide. G. ‘Ann Folkard’ – A natural hybrid with the unique habit of scrambling through other plants, such as taller perennials or shrubs. Bright, light green leaves and rich magenta flowers with black centers. Does best on the West Coast, and in Zones 5-7 east of the Rockies. Struggles in hot climates. G. macrorrhizum ‘Ingwersen’s Variety’ – Zones 3-8. Spring flowers are 1-inch wide, pale pink and held above big pungently-scented leaves that turn bronze or scarlet in the fall. The leaves are 6-8-inches wide, and lobed by deep divisions. Plants grow 15-18-inches tall and wide. The rootstock is fleshy and thick, spreading well in areas of full sun to part shade, making a good ground cover. Prefers rich moist soil, but tolerates dry shade. Heat and drought tolerant (although plants can look wilted on very hot days if in full sun). Propogate by dividing root stock. Doesn’t need cutting back. Grows well with Hostas and ferns. G. x cantabrigiense ‘Biokovo’ – Zones 4-8. 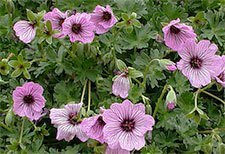 Voted Perennial Plant of the Year for 2015, this fine plant has pink-centered white flowers that bloom from late spring to mid-summer. Grows 8-12 inches tall and spreads to 36 inches. The foliage is fragrant with striking burgundy fall color. Moist, well-drained soil is preferred, but tolerates dry shade. Full sun or part shade. Makes a spreading groundcover, but isn’t aggressive. ‘Biokovo Karmina’ is similar, but with deep rose colored flowers; ‘Cambridge’ has pink-violet flowers. The following plants add beauty to the front of the border as well as rock gardens, but excellent drainage is a requirement regardless of site. G. cinereum ‘Ballerina’ – Zones 5-7. Two-inch open-cup lilac-pink flowers with dark center and purple veins are borne in spring on plants only 4-6 inches tall. The leaves are gray-green, and deeply cut into 5 lobes. 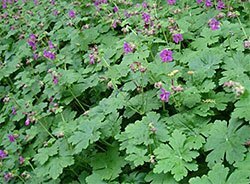 This plant has a narrower zone range than most geraniums and prefers full sun in the northern climates, but partial shade in southern locations. G. dalmaticum (Dalmation Cranesbill) – Zones 4-8. 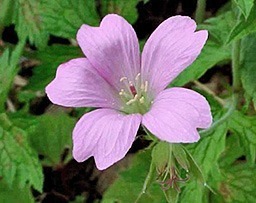 Pale pink, 1-inch flowers are borne 3 to a stem. The plants are low-growing (4-6-inches) with trailing stems that spread rapidly, but are not invasive. Leaves are bluish-green, glossy, deeply lobed and fan-shaped. Best growth occurs with a well-drained soil in full sun (north) or part shade (south).